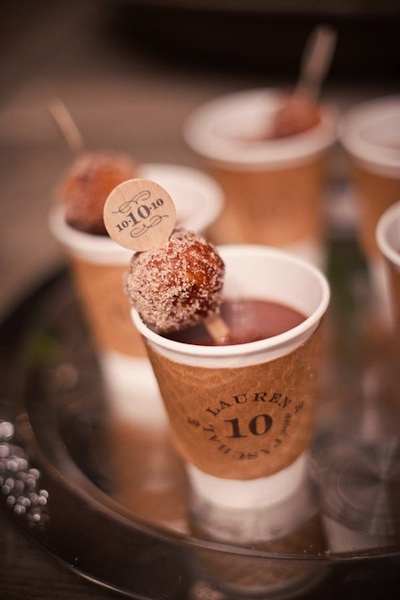 Coffee tea wedding themes are an fabulous idea if you and your spouse are especially avid coffee and tea drinkers and love tasting new and different flavors, whether they're flavored coffees or teas, or flavored additives like syrups, sweeteners or creamers. You may blend a little of both into a wedding theme that is as tasteful and luxurious as the drinks themselves. To do this, you may want to look for specific locations, color schemes, floral arrangements, attire for your attendants, a selection of themed favors and even the menu and your wedding cake for the reception. Look for quaint manors, villas or tea rooms that are reminiscent of Victorian England or depending on the size of your guest list, time of year or geographic location, you might consider an outdoor reception at a local park where you can decorate pavilions or tents to design your theme. While the variety of color schemes are limited only by your imagination, shades of browns and greens will make beautiful wedding colors that complement each other, and you can easily contrast those colors with a luxurious cream tone. Today not all of your bridesmaids need to wear the same color and with the wide selections of green, brown, honey and orange shades, the possibilities are endless as to how to use your colors. In fact, even the bride's wedding dress can have an accent color to the white or ivory, which works beautifully with the colors of a coffee tea wedding theme. For example, dress the bridesmaids in soft shades of green or honey while the groomsmen wear tuxedos or suits in a coffee brown shade. Add a little "cream" to the coffee and tea colors by accenting the bridesmaids dresses with sashes in a cream, ivory or antique white color. The groomsmen can contrast their brown attire with vests and ties in colors matching the bridesmaids dresses. 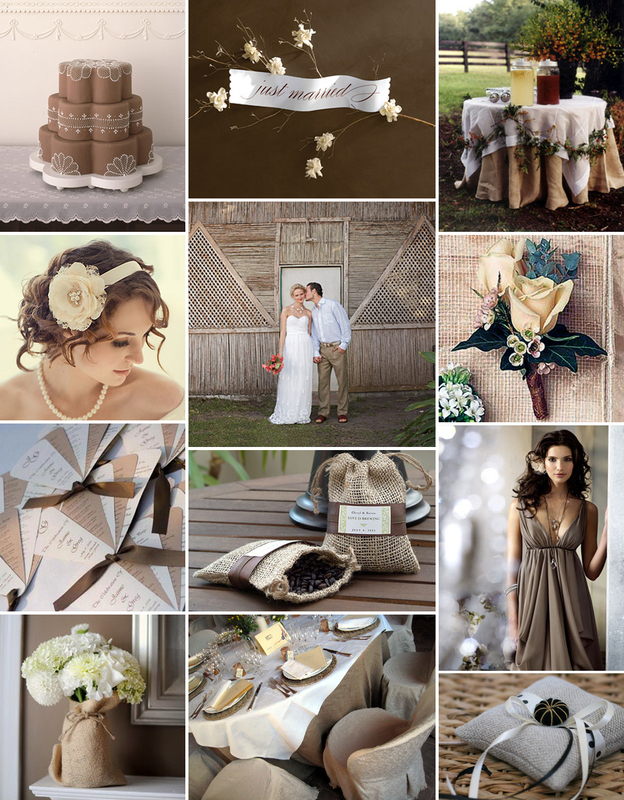 You've now created a colorful wedding party with softly contrasted shades of greens, browns and creams. Use the same colors throughout your bouquets, centerpieces, pew bows and any other floral arrangements you'll have for your ceremony and reception. Some suggestions are white calla lilies with the green stem and creamy white flowers. 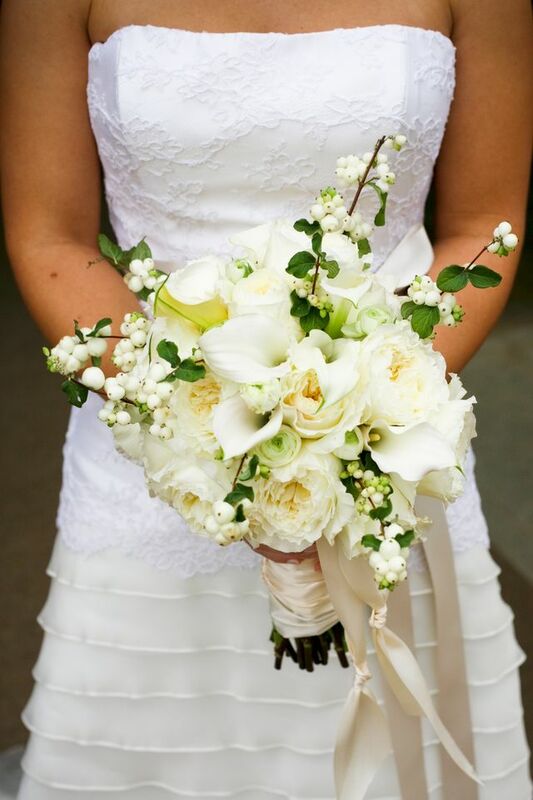 Simply tie the together with satin brown ribbon or tulle, and you have an elegant themed bridal bouquet. The bridesmaids' bouquets and the floral pieces throughout the rest of ceremony and reception locations can be a blend of colors to contrast the bride. Think of autumn flowers with rich golden, brown and deeper green shades offset with a compliment of babies breath or creamy colored ribbons and your tables will be elegantly decorated. One low-budget option for your theme may be to wrap coffee and tea scented candles in tulle or organza with a Thank You tag attached. Other suggestions are small bags of coffee beans and assorted tea bags wrapped in a bag or tied together with colorful ribbons. And finally, whether you decide on candles or coffee and tea bags, you can add a beautiful tea or coffee wedding favor bookmark to each guest's favor selection which will also add a little bit of extra color to each table setting. In keeping with the green and brown shades, use similar floral arrangements for chair or pew bows and use contrasting colors for the tablecloths and place mats. For instance, if you use light green or honey colored table linens, contrast them with brown place mats topped with cream colored napkins. Use colorful place cards in alternating shapes of tea cups and coffee mugs to add more accents to the table settings as well. If you're having your ceremony and reception in the same location, and you're permitted to decorate the interior of the venue, you can use ribbon streamers in honey and dusty rose shades, and have jasmine flower floral arrangements in the ceremony space. 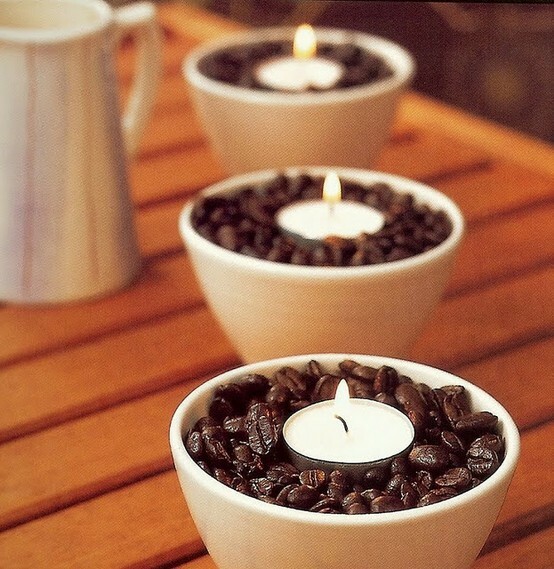 For an evening event, use coffee and tea scented votive candles that will provide a soft creamy glow and add to the essence of the coffee tea theme of your wedding. Consider having a coffee and tea bar instead of an alcoholic bar. Add a variety of tea and coffee flavors or flavoring syrups with some Kahlúa and Irish Crème to your drink selections and you're providing a unique feature to your reception that should certainly be less expensive than serving everyone beer and mixed drinks. Just make sure to stock the bar with sodas and water for those guests who do not drink coffee or tea, especially for your younger guests if you're allowing children. To keep your budget even lower and yet still provide an elegant and tasty menu, consider having an early afternoon reception and serve snacks that go well with coffees and teas - biscotti, biscuits and small sandwiches. For your wedding cake, you can have a marble flavored cake topped with soft browns and greens with deep chocolate brown accents or a buttercream frosted cake, which is a soft cream color, accented with some of the darker colors for a themed contrast. Look around and use your creativity and you'll come up with excellent ways to express yourself and your love of coffee and teas in a luxurious and tasteful coffee tea wedding that your guests will always remember.